This is a race for Teams of 3-5 cars of the same marque, all running together on the grid, against similar teams from other marques. All the cars will have been ranked by the Handicapper into a theoretical finishing order, based on historic lap times and performance. 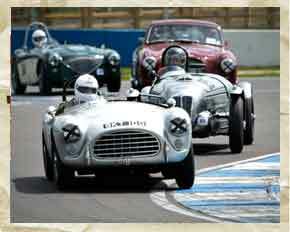 Each car must then a) complete the race and then to score points improve upon their ranked position. If your car ends up in the same position then no points are scored, and if you finish the race lower down the grid than your 'rank', negative points are scored! e.g. If a car is ranked as being capable of finishing 8th, but ends up coming in 6th, then it will score 2 points; If it ends up 10th, then it scores -2 points. Each team then accumulates the points of the 3 cars in its team (if more than 3 cars, then the three highest scores count). The team with the highest scores wins the Team Race. However all teams with three or more cars completing the race are scored ahead of those who only have 1 or 2 cars completing the race. 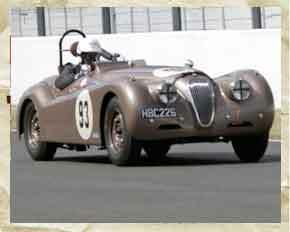 This race is a scratch race for cars in each of the three categories of car in the Club. Gold Standard cars are those most closely resembling the specifications that applied in period. Silver Standard cars are those that may have one or two features that are modified just out of period. Bronze Standard cars are those that are more modified whilst still being true to he essence of the period and the Club's regulations. Where these classes contain over 5 cars, they will be split into Sports cars and GT cars.